Choosing plants suitable for a new planting site is a lot of fun. If you're like me it requires lots of thinking. Probably too much thinking for normal folks. I am guilty of over-thinking. It also requires loads of research. And we all know even doing the proper research can offer conflicting information about the habits and needs of plants. But it is worth making the effort, assimilating the information and being reasonably sure BEFORE you make purchases and begin digging. 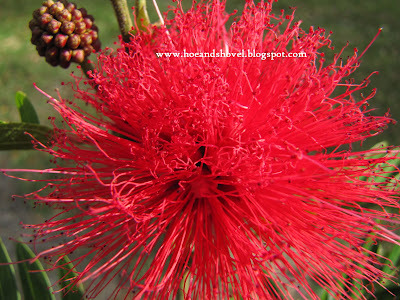 Red Powder Puff, Calliandra haematocephala~~ The only foundation plant I chose that isn't cold hardy to at least 25 degrees. When creating a new space it is helpful to know what expectations you have from the area. The idea of erecting a fence the length of our backyard has never appealed to me. Although many of our neighbors do have fences of some sort delineating each property line. Ours has always been wide open immediately to the north and the south on either side. I prefer the openness. Even so, I had been scheming to create some sort of natural barrier between us and our neighbor’s yard to the north. Not that I want to keep them out. Or us in. It was more about appealing to the aesthetic value of framing that side of the back garden. With the help of construction trucks running through my vegetable garden and into the back yard to dig a new water well for us in January all the mess they made actually jump-started me into some schemes I had conjured up in my mind last summer and fall. You can see in the photo above the over-sized, above-ground portion of the well casing. My hope is that someday it will not be so visible. An eye-sore but like the well-diggers kept telling me, "you gotta have water". And they are right about that. The up-side is the handy location of the spigot for the back garden. Tea olives are not the prettiest plant on the planet. At least not in Florida's climate. I'm pretty sure we are on the outer edge of the zone requirements. Still... they are worth their weight in gold for the immense fragrance produced from the tiny white clusters of flowers that are in bloom most of the year. Having had my eye on them for a while and trying to figure out where to locate one or two at Hoe and Shovel it seemed fitting to purchase three of them to plant atop the new berm. They are slow growers, long lived, and cold hardy. Cold hardy was a requirement for all the foundational plants going into this new planting bed. 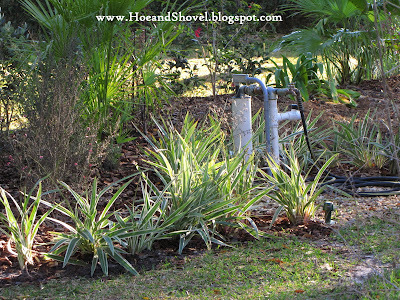 It was my desire to incorporate some palms for what I consider a bit of a change of pace for Hoe and Shovel. Yet I felt they would blend in nicely with the existing environment. They would be my specimen trees if you will. Did I mention they had to be cold hardy! The three I chose are each slow growing, cold hardy, and will only reach a mature height of around 20 feet. European Fan Palm, Chamaerops humilis has fan shaped green leaves that grow more upright and stiff much like a Saw palmetto Serenoa repens (which I love, too). Cold hardy to 10F. Pindo Palm, Butia capitata has blue-green long, arching leaves. 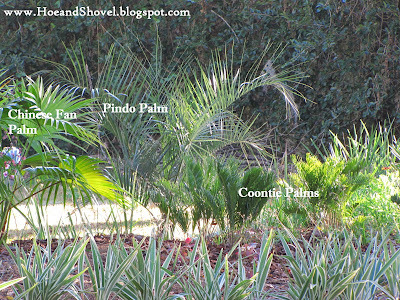 Pindo is under-used in our area as it is cold hardy to 10 F.
Florida Palm Trees has a most useful site with tips, ideas, and great information displayed in easy to use format when searching for a just-right palm for your garden. The Coontie Palm, Zamia floridana is not really a palm although it is palm-like. It is a cycad. 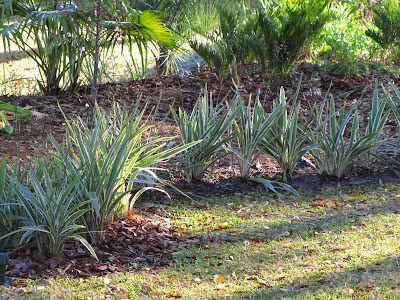 So I'm not really counting it as one of the palms I chose even though 5 more coonties were added to the new berm because the planting bed it links with also has coontie growing. I like to mirror some plants for continuity that are growing nearby while introducing new ones for interest. Rather than using the same plant for the entire border I decided to blend in a few different varieties. Making use of one of my favorites, Variegated Flax Lily Dianella tasmanica 'Variegata' it went in the length of the curvy front side. The side that faces inward toward the rest of the garden. Except for a few feet at the transition where this bed links to the next bed. There a blend of Liriope muscari 'Evergreen Giant' or Giant Liriope and Liriope muscari variegata or Lilyturf was incorporated. sounds like great fun to plan this section - and you're spot on about all of the foundational plantings being cold hardy. We just drove from VT to FL and back, and I saw so many yards in your area that took a hit from those cold temps. I envy all of your choices! I don't have a European Fan Palm, but have always wanted one. I think they are such a specimen plant. Looks like you are having fun rethinking the open canvas that was created by the digging project. I look forward to the details. It has been so much fun. Starting with bare earth (as compared to expanding or altering an existing bed) has wide open possibilities. Our state has definitely taken a hit this winter. Fortunately my yard already has quite a few natives and evergreen plants~~ that's why I'm sticking with that scheme for the bones of each new area. Thanks for stopping by... I sure hope you enjoyed your visit to our beautiful Florida! European Fans are very affordable palms if you're willing to start with a 3 gal or even a 7 gal like this one (I'll have a photo of it in the next post). They make great container palms, too. So if you want one and don't know where to put it right off you could start with one in a pot. Fun. Looks good.Can't wait to see it! Looks very nice. You have been busy. I've been eyeing tea olive as well. I would be interested to see just how you sited yours. Those borders really pull your gardens together. I'm making a note to myself about that. I like this kind of journal. A lot of thoughts went into this bed. As a newbie in the gardening world, I don't have much "design" in my garden, but I do think the right plants in the right spot, maybe a little bit color/leaf texture coordination... It definetly will be a trial-error experience for me. It is good that I can learn a lot from the experienced gardeners like you. Thanks for sharing your thoughts. I was happy to read your comments about your new palms. I want to add one or two to the north side of my house, so I'm researching information on palms to decide what to get. I grew osmanthus in my Atlanta garden. It was a bit boring to me as well, though it makes a great small tree (that actually stays small) when pruned appropriately and does add scent to the garden. I love, love, love the powderpuffs. Yes, they do get fried EVERY winter where I live, but we all forgive their sins come summer. Gorgeous plants! I couldn't grow any of these if I tried, Meems, yet they are so stunning in your garden. I so love enjoying the difference. We still have a blanket of snow covering the garden that, thanks to warmer temps, will soon be gone. Thanks for sharing. 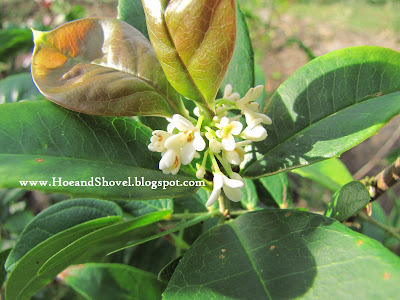 I'm growing a tea olive (Osmanthus fragrans) here in Miami. It's a slow grower and still tiny, but it's in bloom now. I hope it can take the climate. As for cold hardy palms, somewhere I have a photo of Trachycarpus fortunei covered in snow! Meems - your plan sounds beautiful! I am a big fan of tea olive, so I hope those work out for you. I need to look at your bromeliad link. I just wrote an article for a magazine and the person I interviewed got me wishing for one or two of those! Thanks... you need to stop by. The Tea Olives are on the downward sloping side of the berm toward the neighbor's ~~~ to serve as part of the natural barrier and from my side will be in the background. I'll try to give you a better photograph. They are in high shifting sunlight most of the day. I only bought three since I am not sure how they will do. Would have bought more if I KNEW how they will do. The borders are a must (for me)... they hide a multitude of sins. The reds are really standing out this winter when even way down here in Florida we lost so much of our color to winter's chilly ways. There are many underused varieties of palms that will probably work well in your garden. It is good to do the research first. I know you will find what you are looking for and they will be beautiful. Go ahead and write your post on Coonties. Every writer and every blog approaches any subject with such unique perspective. I would love to read your post on Coonties. After reading your post on Viburnums I guess the Osmanthus is a bit like that in that it is not showy. But if it shrubs out (is that a term?) and doesn't get too tall it will be perfect as part of the naturalistic screen I'm trying to create. The fragrance on those little blooms is amazingly strong. I've heard from several locals they don't do that great here. I'm giving them a chance anyway. I've been working on this plan since last October... I should say scheming in my head, researching and envisioning it. Once started on it there are tweaks and switcheroos but~~ all in the fun of it. Enjoy the warmth of the fire while it is still snowy. Soon you will be transitioning into your warm, sunny days by the lake. So much goodness now and so much to look forward to, my friend. It always makes me smile to see palms covered in snow. Remarkably and unbeknownst to some ~~ a few of them can take it. Good to know you are growing tea olive so far south... that's encouraging! You could definitely have fun with bromeliads. They do like humidity so they might not make it through your winter. It would be worth giving them a try... maybe in a container. Here we can grown them dangling from the oaks without any medium. I think I first heard of tea olive from you. It got me thinking and researching. They aren't easy to find in this area but my local garden center sells them. I'm hoping for good results, too. Meems, I smiled when read that your plants should be cold hardy. But this season proved that winter is winter even in Florida. Love your choice of plants. I'd be happy to replace some of my fir trees with palm trees! Thanks a lot for your comment on my pampas grass post! meems, The new garden is coming along very nicely~ and the palms look right at home. My understanding of things to come weather wise is that it's going to be variable. Which I take to mean~We'll never know for sure how cold/wet the winters might be or how warm/dry the summers might be. We never know now, it's just possibly going to be a bit more extreme. Hi Meems~~ I'm thinking those protruding pipes don't look too bad, a lot better than the trucks that brought them there. Won't it be nice having the water source closer to where you want it. I like your palm collection. I look forward to seeing more. You might find that there are some palms for your climate... wouldn't that be fun! Everytime I take a photo all I see is that awful plumbing but you are sweet to try to console. My best hope is the landscape will cover better as it fills in. Such is life outside the city... I prefer having a well over city water so it's a trade-off. DEFINITELY better than those ginormous trucks compressing all my soil. Love your new header hibiscus photo! I really admire the thorough planning of all of your garden additions. I wish I had started my journey into gardening with more thought and planning. My garden is a crazy mix of colors and texture. I like your plan of making natural barriers instead of erected fences, it leaves that sense of openness intact. It is easy to get excited about that must-have plant and forget to think about the 'big plan'. Not that I have a big plan it's just that I kind of know (after so many years of doing this) where I want to go with my garden. One of the exciting aspects of gardening is that we can pull it together even when it feels willy-nilly... say, with a border or with moving a few things around to make it more cohesive. I know your garden is beautiful and so wonderfully tropical. Luckily for all of us ... gardens are very forgiving. HELLO THERE! I stopped blogging when I had to leave my garden almost two years ago. I don't know if you remember but I was starting a veggie garden in Austin. Well, I've since moved, and closer to your neck of the woods, funny enough! I'm in Montgomery, Alabama and starting anew in many ways, including with gardening! It's funny-- I had never heard of tea olives until I met my boyfriend who kept insisting that they smell wonderful. I cannot stress to the other readers of this blog how UNREAL the scent is. They're not particularly pretty but they do make a nice little normal-looking bush but are amazing when they bloom. We have already procured two and will probably be getting like, 10 more. I am also looking into other fragrant bushes and vines. In Texas, we had the Texas mountain laurel which not only produced clusters of gorgeous purple blossoms, but also smelled like grape bubble gum. Anyway, I love love love this blog as it's so informative and beautiful. Thank you for befriending me before and offering me encouragement when I was just starting out. I'm always trying to learn and always looking for inspiration! I'll be visiting again soon! I apologize I did not respond to your question. I bought the powder puff at Duncheon's Nursery in Lutz. It can get quite large but will also freeze and then return. Of course I remember you and I'm SOOO glad you let me know you moved. I've wondered about you on many occasions. You were so eager to build your veggie garden and I could tell you had it in your blood to make it happen. If I remember correctly you were either going to school in TX or trying to get into school. I wonder if that is why you moved to AL? The veggie garden has been restored ~~ I'll be posting more on that as soon as I find some time to put it together. I've been keeping busy with that and the new berm. The tea olives were sited in the background because they aren't particularly lovely except for that amazing scent. I hope they do well for me. It is really nice to hear from you and find you are still doing well. Thank you for your kind words about my blog. I am still learning as well... it's what I like about blogging. Gardeners are the best at sharing their knowledge and there is always more to learn. I'll follow your link back to see if you have decided to blog again. I hope so.